The Case That Turns Your Smartphone into a Polaroid Camera! 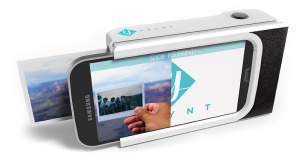 It’s funny that the more technology keeps on advancing, the more things from the past are becoming “cool” again; such is the case with these new phone cases by startup company “Prynt” that turn your smartphone into an old favorite….a Polaroid camera. Polaroid cameras became almost laughable over the years being the quality was far from today’s digital cameras with every bell and whistle you can think of, but the idea that you can snap a picture and have it printed out and in your hands almost right away seems to be a fun novelty once again. In fact I was recently at a wedding where one of the most sought after experiences was having a picture taken by a friend of the groom that had a mini Polaroid and was giving out pictures. Now Prynt has come up with something that meshes the best of both worlds; a phone case that produces Poloaroid pictures, directly from your smartphone! According to Tech Crunch, the case is still in the prototype stage, but we predict this will soon be one of the hottest smartphone accessories especially since it will apparently only cost $99. Pictures printed directly from your smartphone with the ability to hand out to whoever you want without the wait? This has “next big thing” written all over it to us; even if the novelty eventually wears off to some degree, this will be an item that all ages will enjoy for years to come. How to Afford the Galaxy S8, Can Cell Phone Data Identify Depression?